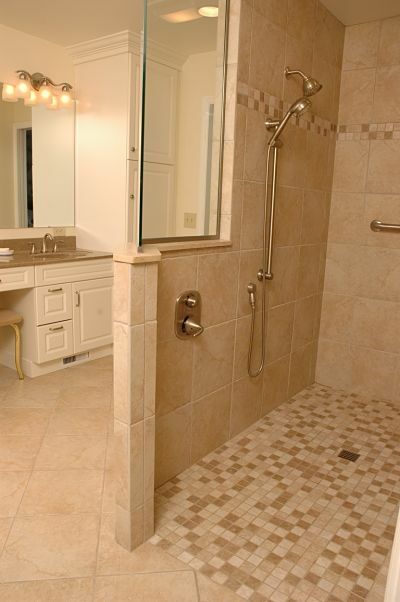 Elegant master bathroom features a custom walk-in shower with granite accents. The advantages of a walk-in shower include ease of access, easy maintenance, comfort and an almost endless range of design options. 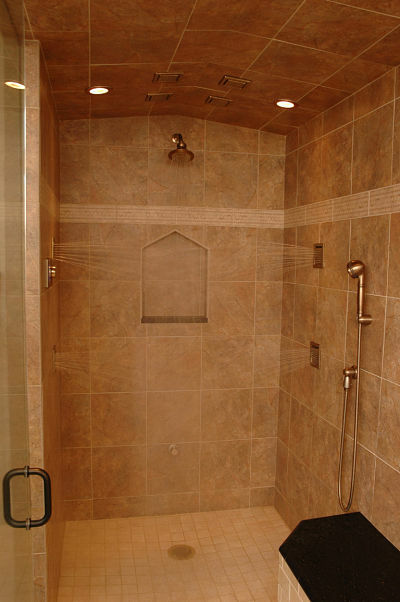 Because they are so popular, we created a new homeowner’s guide – Walk-in Shower Design Ideas – that’s filled with photos and descriptions of many walk-in shower projects we’ve designed for our customers right here in the Greater Cincinnati area. The guide begins with some of the common questions we often hear from homeowners. 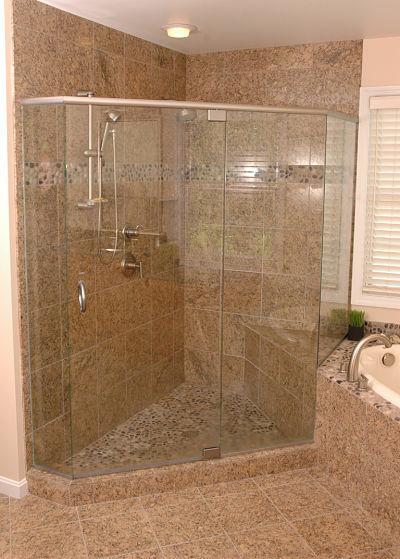 Three major concerns are: the amount of space needed for a walk-in shower, plumbing requirements, and the impact replacing a tub with a walk-in shower might have on a home’s resale value. In the guide you will find the answers. Walk-in shower base fitted to a corner and integrated with a tub. There are three design options for walk-in showers: a walk-in shower with a door, a doorless walk-in shower and a walk-in shower with a privacy wall. The guide includes several photos of each design option. Custom walk-in shower with no door. 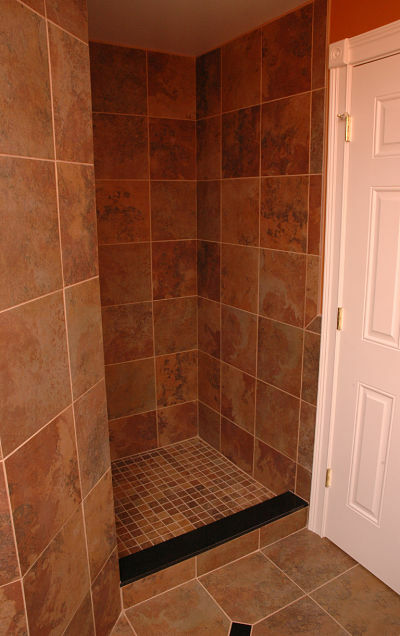 When selecting wall and floor tile for a bathroom and walk-in shower, consider who will use the bathroom and how they will use the space. Popular products include ceramic wall tile, subway tile, easy care tile, natural stone, various mosaics and border tile. In the guide you will find photos of a variety of tile products and designs. The easy care tile used in this walk-in shower includes large wall tile with glass mosaic accents, a subway tile border, slip-resistant floor tile and granite used for the shower bench seat and shelf. There are six types of showerheads that create a relaxing or invigorating shower experience. The options include wall or ceiling mounted showerheads, body sprays, handheld showerheads, multiple showerhead installations and showerheads with speaker. 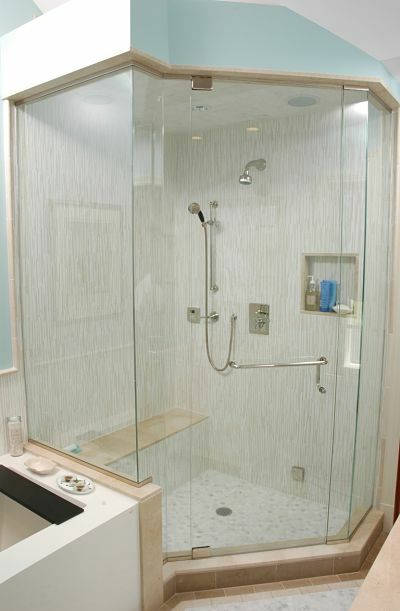 Walk-in shower with body sprays, wall mounted rainfall showerhead and handheld showerhead. Today’s shower stalls can be equipped with accessories that add both comfort and function. Among these accessories are steam baths, shower benches, built-in wall niches and shelves, grab bars and heated towel bars. In the guide you will find examples of each of these accessories. 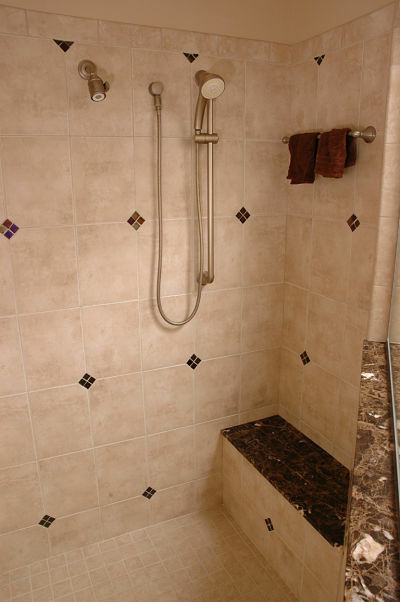 Walk-in shower steam bath with shower bench, grab bar and wall niche. An innovation in bathroom lighting and ventilation is the fan/light. Manufacturers are producing efficient, quiet and stylish fan/lights that vent steam and odors and blend into décor. Walk-in shower with level threshold and fan/light. Safety, comfort and access are essential to the design of any bathroom. Home accidents often occur in a bathroom. Universal Design elements can be used in walk-in showers for safety and accessibility for users of all ages and abilities. Read about these features in the guide. 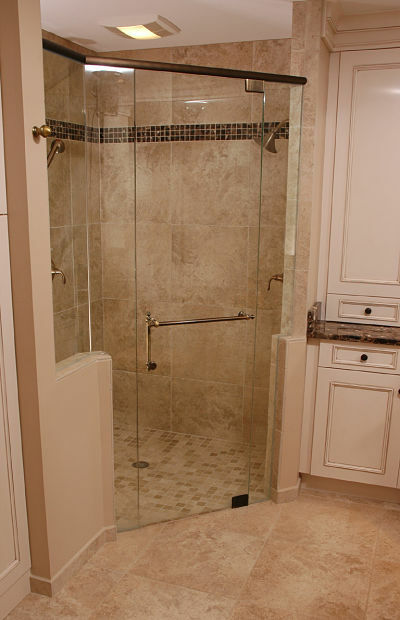 Walk-in shower with Universal Design features. In several sections of the guide we’ve noted the importance of working with a bath design professional. 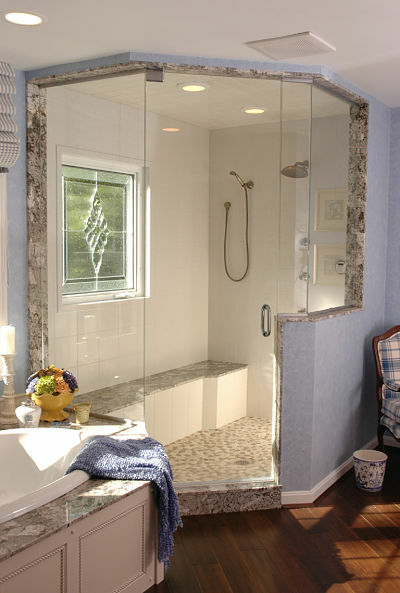 Bathrooms and walk-in showers present complex design issues during the course of remodeling. Our Walk-in Shower Design Ideas guide will help you ask the right questions and focus on important facets of your project when you meet with a designer or contractor. We hope you find the guide helpful.